When it comes to luxurious comfort, there's not much we love more than a cosy cashmere jumper - one of the softest clothing fabrics out there. But usually the luxury material is out of many of our price ranges. That is, until now! On last weekend’s episode of This Morning on Sunday, Ruth Langsford proved that cashemere doesn’t have to blow the budget, when she wore a gorgeous jumper in the fabric whilst on air. The popular presenter chose an elegant cream jumper from Marks & Spencer, and rather than costing a fortune, it’s on sale for just £79. While that may be more than you’d usually pay for a jumper, cashmere clothing is known to be high-quality and long-lasting, meaning it’ll be a winning investment for your wardrobe. And on top of that, other cashmere pieces on the high street can often cost far more than £79, with many similar jumpers available for closer to £200. So M&S’s offering is a pretty brilliant bargain! Ruth opted for the cream version of Marks & Spencer’s Round Neck jumper, but the item is available in plenty of other colours if you’d rather something different. Go bold with a stand-out mango or pink, or stay subtle with a silver grey or elegant bluebell colour. It also comes in a simple statement black, a lilac, a dark blue, a navy, and a tan colour. And it’s not just Ruth who is a fan of the M&S cashmere jumper. The piece also has hundreds of positive reviews online, with shoppers sharing how comfortable they found their purchase. One said, ‘Lovely texture – very warm & comfortable. Very attractive colour’, while another customer wrote, ‘I love M&S cashmere jumpers & this year the colours and styles are amazing’. While a fourth said, ‘Classic. Very cosy, worn on its own it doesn’t itch either. Great fit and quality’. 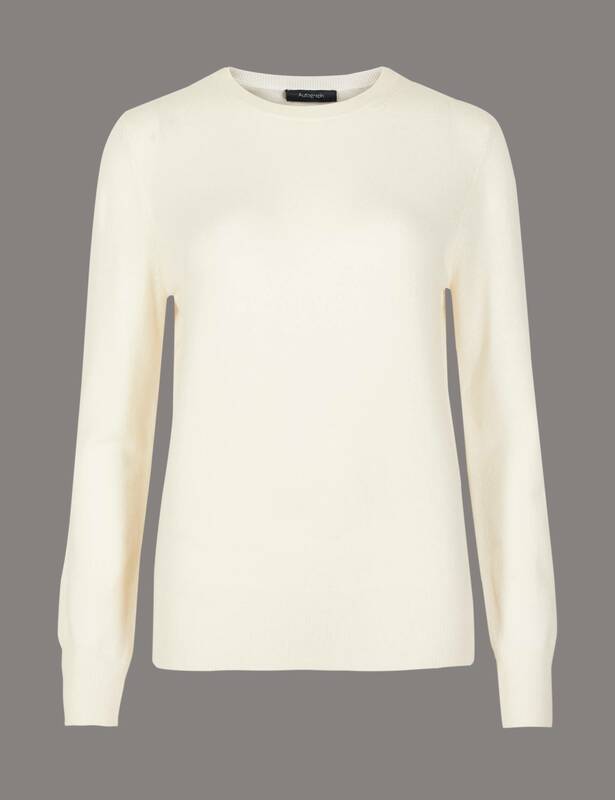 Will you be buying the gorgeous M&S cashmere jumper for yourself?